Army soldiers quarantined in Italy after return from Liberia. 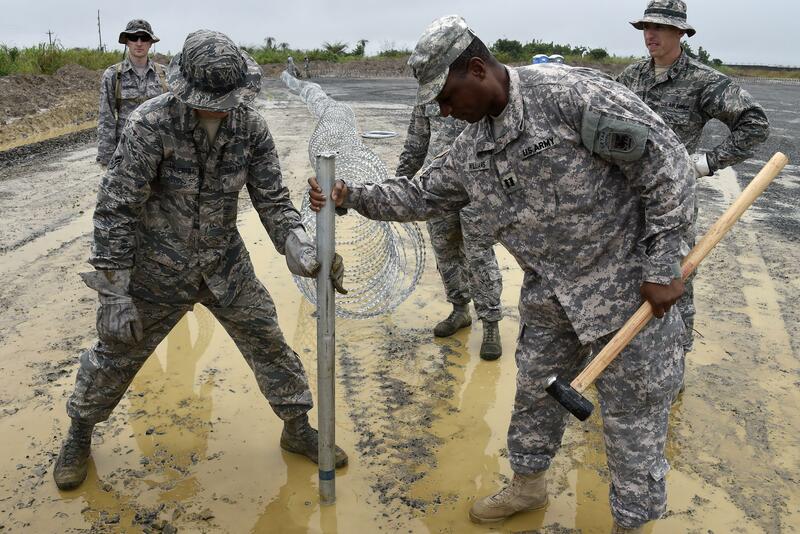 U.S. military helps build Ebola treatment center in Monrovia. U.S. soldiers returning from work helping to combat the Ebola outbreak in Liberia are being quarantined in Italy, according to military officials. Eleven American soldiers—including Army Maj. Gen. Darryl A. Williams, commander of U.S. Army Africa—have been under what the Pentagon calls “controlled monitoring” since arriving at a U.S. military post in Vicenza, Italy, over the weekend. [The soldiers] apparently were met by Carabinieri in full hazmat suits. If the policy remains in effect, everyone returning from Liberia - several hundred - will be placed in isolation for 21 days. Thirty are expected in [on Monday]. … The soldiers are confined to a building and unable to see their families, Martin reports. The decision made by the Army and applies only to soldiers returning from Liberia. Defense Secretary Chuck Hagel will decide whether to make isolation apply to members of all services returning from Liberia. Martin reports that the soldiers in isolation are in a building that is used as a command headquarters. It has communications - secure communications - so that Gen. Williams and his staff can do work. It also has a gym. Williams and his team have been in West Africa for 30 days, to set up the initial U.S. military assistance there and have traveled extensively around Liberia. The team was in treatment and testing areas during their travels. Speaking to reporters two weeks ago while he was still overseas in Liberia, Williams spoke of the extensive monitoring that he was given. “We measure, while we’re here – twice a day, are monitoring as required by the recent guidance that was put out while we’re here in Liberia. I – yesterday, I had my temperature taken, I think, eight times, before I got on and off aircraft, before I went in and out of the embassy, before I went out of my place where I’m staying,” William said during the October 16 press conference. A Pentagon spokesman told ABC News “there was no one incident that triggered the Army’s decision as the personnel in question did not have direct contact with Ebola patients.” The move by the Army to quarantine the soldiers comes as state and national officials have differed on the level of precaution needed when dealing with individuals returning from combating the virus in West Africa.